The head crusher was widely used during most of the Middle Ages, especially the Inquisition. 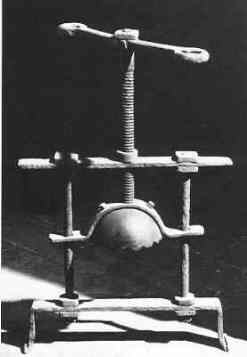 With the chin placed over the bottom bar and the head under the upper cap, the torturer slowly turned the screw pressing the bar against the cap. This resulted in the head being slowly compressed. First the teeth are shattered into the jaw; then the victim slowly died with agonizing pain, but not before his eyes were squeezed from his sockets. This instrument was a formidable way to extract confessions from victims as the period of pain could be prolonged for many hours if the torturer chose to. This could be done by repeatedly turning the screw both ways. If the torture was stopped midway, the victim often had irreparable damage done to the brain, jaw or eyes. Many variants of this instrument existed, some that had small containers in front of the eyes to receive them as they fell out of their sockets.